Alpine Village apartments are located a short distance from central Queenstown, away from the hustle bustle, just a 5 minute taxi ride away. The apartment is Lakeside on Frankton Road and a short stroll from the Frankton Track - a cycle/ walking track that leads from Frankton to central Queenstown. Bus stops are situated just outside to take you to town or skiing or even into Arrowtown or the Airport. My apartment comes with a private garage on the ground floor and the accommodation is linked via a staircase on the first floor. My apartment is on the end of the block it is light filled and has great views of the lake from the lounge. It has been recently painted and tiled throughout and furnished to a high level. The kitchen has granite bench tops, 2 gas hobs, electric oven, microwave and fridge, and plenty of crockery is provided. Tea, coffee, milk and sugar and a sweet treat is provided when you arrive. Free wifi is available and tv as well. The lounge has an electric heat pump to keep you warm in winter. The bedding has been chosen with your comfort in mind, warm duvets and electric blankets are provided. The bed can be made up as a super king or 2 singles beds - you choose! The shower ensuite has an attractive granite vanity and a newly tiled shower. Plenty of towels are provided. Shampoo, conditioner and body wash also are available for your use. There is a washing machine in the garage that you are free to use and further laundry facilities are available in the Alpine Village Apartment complex fees apply. When cooking please use the fans provided and open the windows to ventilate. When using the shower, close the door, use the fan provided and open the window to ventilate. The apartment is fitted with sensitive smoke detectors . No smoking please, even on the deck!!! Please enjoy my apartment and treat it as you would your own home! My son purchased this apartment about 3 years ago. However Lynne - the Mum- does the day to day booking and organising of the apartment. She has experience Doing this with 2 other places of her own. James liked this property because it was an end apartment, lakeside with views and easy access to the Frankton Track to walk to town. Also the bus stop is right outside which is handy to go skiing in the mountains or off to town. Newly decorated. When James bought it he got it painted and furnished it with the visitor in mind. Comfy bed and great linen, well stocked little kitchen. Tv . Having a garage is really handy and keeps your vehicle safe and out of the weather. 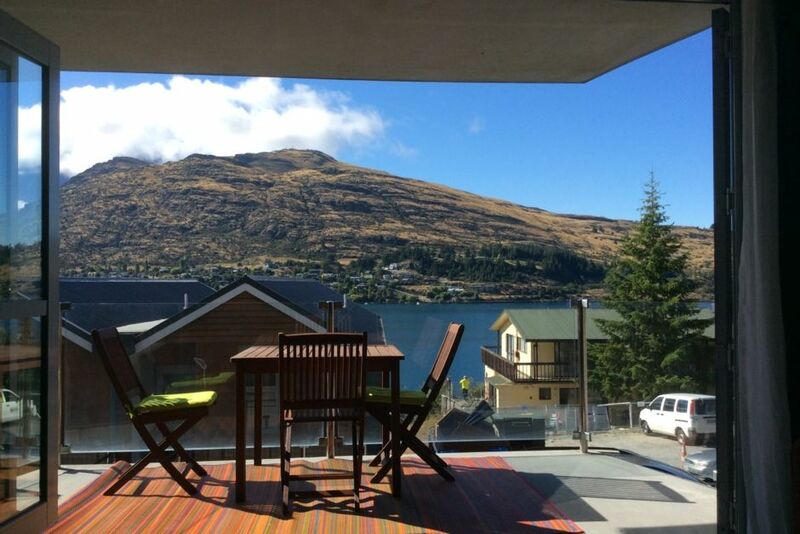 Lake side apartment, with track that you can walk straight into Queenstown. Mountain view from the lounge and deck. View of lake and mountains from the lounge and deck. We loved our stay. A comfortable apartment with all the essentials. Lynne has put a lot of effort into making it a lovely stay for her guests. You can park car inside garage. Boathouse was not a 10 minute walk for us old folks home. Bus near place for ride to town. We loved this apartment. It is very spacious and extremely well equipped and located. (Though it is a few minutes drive outside Queenstown, we found that to be an advantage given the traffic in town.) Lynne was very helpful and replied promptly to any query. Modern, clean property which was perfect for our needs, close to public transport which was easy to get to from the airport and also into town. Wonderful view and a relaxed atmosphere made us feel like we were at home away from home. Would love to come back again, thank you for having us. It was a pleasure having you stay. You would be welcome back any time! Beautiful apartment. Has everything you may need! Thank you Lynne for a wonderful stay. We enjoyed the walk into town along the path and appreciated all of the information you have available. Very comfortable 2 nights! Wish we could have stayed longer! Thanks again! Great location with views of the lake. Apartment is clean and Lynne had thought of everything (eco friendly shampoo, conditioner, sanitary products, hair dryer ect). Had a wonderful stay, thank you!